We all woke up before 6 am. I had some weird dreams this night. They are too personal to describe here but they were very special. I had never experienced such vivid visual dreams as this night. We decided to start walking early. There was no breakfast possible this early. Because of San Fermin in Pamplona the Albergue was not open and this meant we had to walk to the city or village after Pamplona. Walking was going well if you consider we slept outside last night. It’s kinda funny that 7 pilgrims slept outside. The pace was so different for everyone that everyone decided to walk his own pace. When I arrived in Pamplona I was shocked. I was afraid for the noise and speed. Incredible if you keep in mind I just walked 2 days in the quiet nature. I live in the centre of Maastricht and I’m used to traffic. I also like speed. Strangely I was shocked. I felt a little bit in a different world. I ducked down when a Harley passed me. I was thinking how is this possible? Somewhat later I saw a car coming fast towards me and was braking late. All things which are complete normal but now I was cautious. And no… I still like speed 🙂 Those people weren’t behaving ridiculous or so but I wasn’t used to it anymore! I also had to watch better the directions to Santiago. In the city this is harder than in the nature. Funny was that while I was walking a man spoke to me in Spanish : “Buen camino, proxima rotonda gire a la derecha”. So I had to go turn right at the next roundabout. Really handy if you understand and speak a bit of Spanish. It was correct I had to turn right. Walking went well but I was worrying about having a sleepingplace. What if I now again hadn’t a sleepingplace, was I able to support that. If you walk this much you want to have some nice sleepingtime. Today I was walking around 20 kilometers. The arrival in Cizur Menor was emotional. I went inside at the first pilgrim albergue I saw. Completely exhausted. I asked in Spanish if they had a place to sleep for me. I didn’t ask for the possibility of eating there because I wasn’t interested in food at that moment. I just wanted to sleep. I had some luck. It was a donativo albergue of Orden of Malta. You can decide yourself if you want to donate and how much. In the kitchen they had food which you could prepare. I just wanted to take a shower and going to sleep. After the shower I felt better. I was again in my camino rhythm. Just wanted to do the laundry by hand so it had time enough to dry outside. My towel was really dirty. It was hard to get the dirt out of it. While I was doing the laundry a gorgeous girl came towards me with a question… She asked me if I could explain her how you have to do the laundry by hand. I found it funny she was actually asking this to me. I said I hadn’t that much experience and just do it. She asked my why I was doing the laundry in such perfect manner. That was only because I was trying to take out the dirt of my towel, no other reason. With the hand you never can clean as good as by a washingmachine. Now she understood me. She worn a white bikini and looked really hot. I know you don’t have to prejudge people but I had to think about Paris Hilton and California. I asked her if she came from California and…. she did. After finishing my laundry I went into Cizur Menor to buy some food in a supermarket and look for a restaurant. I saw she was doing her makeup and was thinking why she is doing this while it’s so hot here.. nobody does that here… we will see if she does that in some days… I saw the makeup melting from her face. I was annoyed that I had no blanket. I had to lay on top of the bunkbed. Today was a nice day considering the view of pretty ladies. The bed next to me was a young nice pretty woman… the funny thing is that I was not interesting in chatting or flirting. I was here for something else. Afterwards I was aware this went all natural. 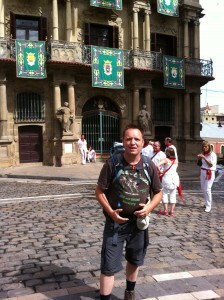 During my arrival in Pamplona the people were celebrating San Fermin. Camino de Santiago signs on the sidewalk in Pamplona.